Sylvester is the Project Architect for the scheme. 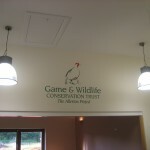 The scheme is a conversion of a brick animal shed to multipurpose visitor centre for the Allerton Research and Educational Trust which includes a large hall, a smaller ‘boardroom’, a reception area, kitchen, store, boiler room and toilet facilities. 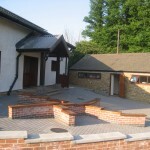 The former Visitor Centre would be converted to offices to house the five staff. The design of the centre encompasses the environmental friendly concept and utilizes locally sourced materials. 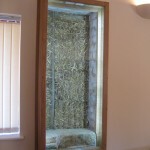 Existing Masonry wall are cladded on the outside with the Estate own by-product – compressed straw bales through farming. 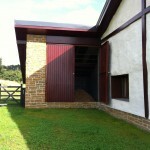 The bales are finished in a lime render and a lime wash. 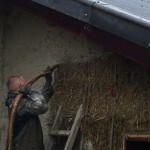 The roof is insulated with a product called Therma Fleece, which binds the washed and carded sheep’s wool into bales after the carding process. Sheep farming is one of the main activities that the Trust carries out and the use of this material is a true reflection of the by product from the estate. 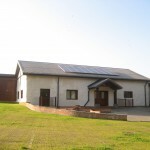 16 solar PV panels are installed to the roof to generate electricity, excess are sold back to the grid. Rainwater is collected and stored in an underground 13,000 litres harvesting tanks for toilet and external use. This tank is located in the reconfigured front yard. 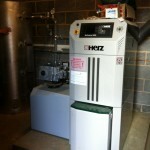 A35kW wood chip biomass boiler is also incorporated to provide heating and hot water to the premises with wood chips sourced from the Trust owned adjoining woodland through annual maintenance. 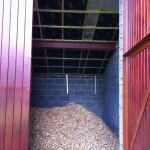 Recycled plastic materials are installed for fencing and grass reinforcement to car parking area. 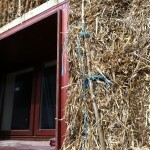 The building achieved an A rating for SBEM and very good rating on BREEAM. 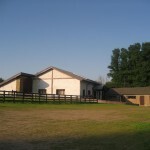 The Trust – seminars and conferences to promote sustainable farming, including field walks.The centre is also used by the local Women’s Institute on a regular basis for their meetings. The conference centre is also available for private hire for all local residents. 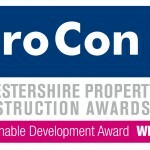 The Visitor Centre is the winner of Sustainable Development Award for Leicestershire and Rutland Property & Construction (ProCon) Award 2012. Leicestershire and Rutland Prohelp members Pick Everard, GCA (UK) Ltd, Landmark Planning and Parkinson Dodson & Cheung had provided substantial pro-bono structural, transport, town planning and architectural support during the early stages of the project. The project is kindly supported by DEFRA and European Agricultural Fund.